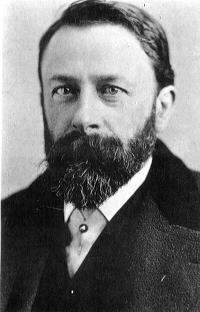 Today in Masonic History Albert Bierstadt is born in 1830. Albert Bierstadt was a German-born American painter. Bierstadt was born in Solingen, Germany on January 7th, 1830. In 1831, his family moved from Germany to New Bedford, Massachusetts. From an early age he had an interest in art and would draw clever crayon drawings in his youth. At the age of 21 he began working with oil paints. In 1853, Bierstadt returned to Germany to study at a school in Düsseldorf at an informal painting school. In 1857 he returned to New Bedford and for a brief time taught painting before turning his attention full time to oil painting. In 1858, Bierstadt displayed a large painting of Swiss landscape. The painting would get him elected into the National Academy of Design, an honorary association of American Artists, in 1860. After his showing in New York City of the Swiss landscape, Bierstadt began painting landscapes from around New England and Upstate New York, particularly the Hudson Valley. In 1859, Bierstadt made his first trip west. He returned to his New York City studio with a variety of sketches that would become oil paintings of the western United States. He would travel west again in 1863. Through out the 1860's Bierstadt would use the resources that he collected on his trips out west to create a variety of oil pairings. During the American Civil War, Bierstadt paid for a substitute to serve in his place. He would also paint one Civil War themed picture called Guerrilla Warfare, Civil War in 1862. It was based on a stereoscopic picture that was taken by Bierstadt's brother. In 1871, Bierstadt took a trip to Yellowstone. The paintings that he would create from his trip would inspire the United States Congress to declare Yellowstone a National Park, the first of it's kind in all of the World. One of his large pairings was purchased by Congress for $10,000. Because of this, Bierstadt was sought by every explorer who was heading west to explore new territories. He was also commissioned by three different railroads to travel to the Grand Canyon to gather further subject matter. Despite the popular success that Bierstadt enjoyed, many critics dismissed his paintings as being too much fluff. At least one critic described him as a "vast machinery of advertisement and puffery." He would create more than 500 pieces in his lifetime, although many were burned when his studio burned in 1882. By the time of Bierstadt's passing on February 18th, 1902, the taste for epic landscapes had passed and he died largely forgotten. It was not until 1960's when his small oil studies were rediscovered and his art was looked at in a new light. Bierstadt was a member of Holland Lodge No. 8 in New York City, New York.